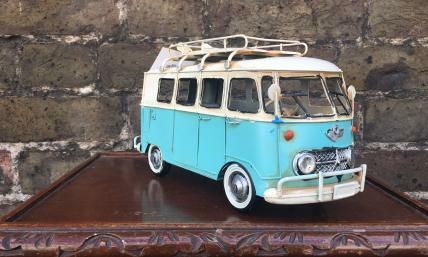 This vintage Volkwagen style model Camper Van is made from tin plate and finished in handpainted light blue. This retro design strikes a chord with travellers, surfers, hippies and VW enthusiasts alike. This ornament is popular with gift shops and suppliers of auto memorabilia in particular.